With Billionaire's Help, Sochi Strays Escaping Death: After Russian officials began killing stray dogs ahead of the Olympics, a shelter funded by Russian billionaire Oleg Deripaska came to the rescue. 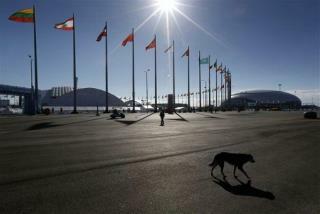 Volnoe Deloe—or Good Will, roughly—went around Sochi's Olympic Park grabbing every dog it could find via a "dog rescue" golf cart. After Dad's Plea, Facebook to Make Video for Late Son: A Missouri man whose personal plea via YouTube to Mark Zuckerberg became an Internet sensation will get to see a Facebook video of his late son after all. Facebook agreed to make a "Look Back" montage for Jesse Berlin, who died in 2012. Good Samaritan Pays Off Kids' Lunch Balances: Hear about that story out of Utah about a school that took lunches away from kids because their families were behind on payments? So did Kenny Thompson of Houston, who checked with his local school to see whether anything similar was happening. It was, but his $465 donation brought all the accounts up to date. Wrong Number Saves Man's Life: With a blood clot threatening his life, a British man reached for the phone and dialed the wrong number—but as wrong numbers go, this was the right one. Hearing heavy breathing and moaning, the woman who picked up initially believed she was the victim of a prank call. But after Mary Readman heard the man on the line struggling to hang up, she decided to call back. It saved his life. Sharks Rescued From Fish Market Grow Into Pups: Three baby sharks swimming off the coast of Malta got there in incredible fashion. Members of a conservation group came across dead nursehound sharks being sold at a local fish market, removed the eggs, and brought them to the Malta National Aquarium, where they hatched. Still more are being incubated.